It's cl ear from Motorola's latest earnings report that their RAZR phone is a big hit. Even before reading that story, I had a strong sense that this was the case, and it wasn't just because I see these sleek phones for sale everywhere I look. My epiphany came Saturday night when during dinner I noticed that two of my close friends have RAZRs (as do my wife and I). The reason this struck me is because at no time in the history of cell phones, or of knowing my friends, have any of us ever owned the same phone, much less at the same time. The fact that we all currently own the same mobile phone, at the same point in time, demonstrates to me that Motorola has come up with something important. Everyone agrees that the styling (especially the thin profile) is incredible. On the other hand, I also own a Treo 650, and recognize that the RAZR phone is very much a consumer device and not one for any serious business professional (no real email support is the biggest issue, but there are several). However, given my addiction to email (the first step in recovery is admitting your addiction), I'v e found having phone without email access is quite liberating (ever stop to notice how everyone with Blackberrys and Treos are always messing with them?). 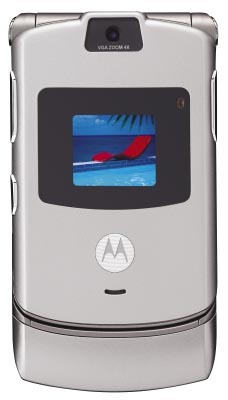 Plus, given the RAZR's svelte design, it fits nicely in my pocket, certainly a lot better than the bulky Treo. So, I've dubbed the RAZR my "nights and weekend" phone despite the fact that I'm sometimes using it during the day as well.